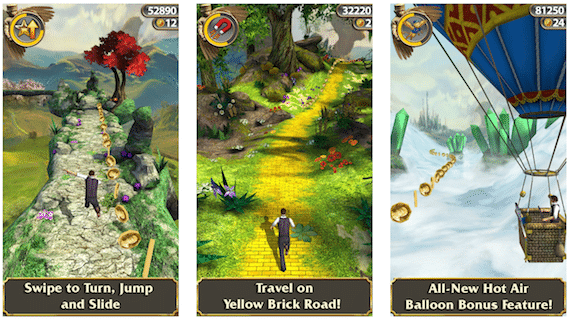 Temple Run: OZ of the developer of games like Temple Run 2, Imagi Studios in association with Disney again appears in the App Store, as a promotion for the upcoming movie premiere company in Spain called OZ. A fantasy world. The game is an adaptation of the popular game Temple Run 2, which like as with the premiere of the Disney movie also, Brave , re-launch a promotional project together. Includes new features not available in the original, with scenarios inspired by the upcoming movie company. In the game you can fly through a balloon with which to earn some extra coins in your game, it is characteristic that the road ahead will be paved known yellow OZ.Otra world of new features included in this game is the appearance of weekly challenges for your enjoyment competing with your friends. You can download this new application that is sure to become another success, Temple Run: OZ from the App Store at a price of 0.89 euros simply by clicking the link below these lines. Willing to flee again to get more points than your friends in Game Center? 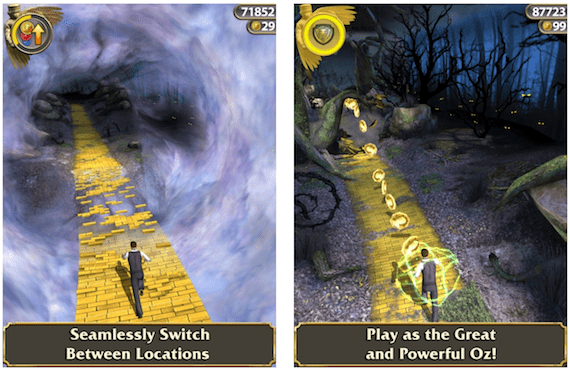 Article Imagi Studios and Disney launch Temple Run: OZ has been originally published in News iPhone .